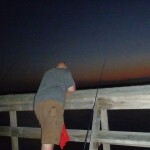 When we discovered we could fish on the Pier at Hunting Island State Park for free with our SC state park pass we decided to head down to Savannah GA to shop at the Bass Pro Shop for some heavy fishing poles. 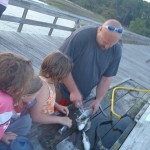 Jody and Lydia really want to catch some fish for dinner but after a few go arounds they mainly caught some small whiting. 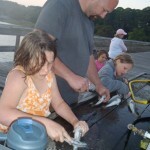 The gals and Me spend our time in the salty water while the fishermen get to smelly from their bait. 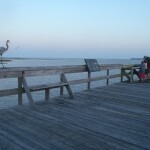 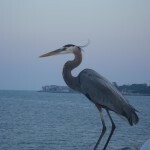 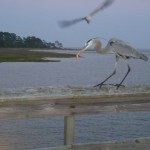 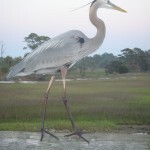 There is a heron that hangs out on the Pier waiting to help itself to your catch. 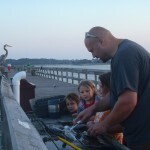 Jody saw it fish for its on dinner but the word on the Pier is the heron only snatches your biggest fish if it can get close enough to your cooler 🙂 The girls enjoy touching, watching and helping clean the fish. 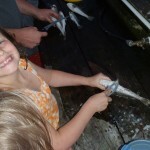 The heron didn’t snag any of our fish, but we did give it some fish eggs as we were gutting the whiting. 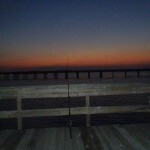 We are still on the look out for great fishing spots……leave us a comment if you know of a place where there is great fishing! 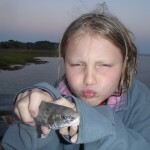 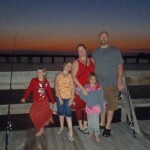 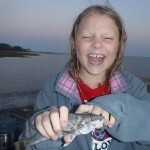 This entry was posted in Family Fun, Hunting & Fishing, Scholl Critters on April 15, 2012 by Chasity.